*two red/white Christmas tutu stockings. 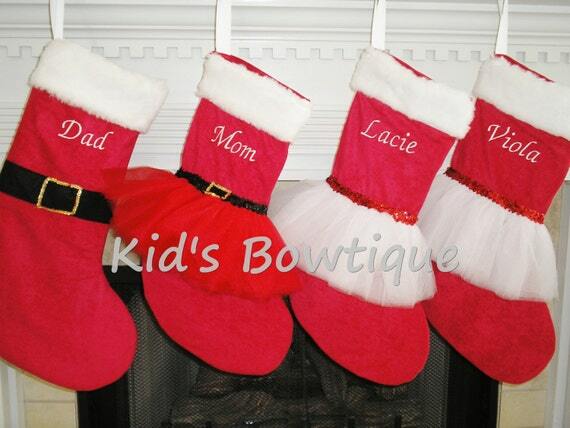 Our unique personalized tutu Christmas stockings are made of high quality plush red fabric. Each stocking is a nice large size, approx. 21 inches long and 11 inches wide at the "foot". A tulle tutu is added for uniqueness, sequins for dazzle, white fabric "fur" top for style, and embroidery in white thread for personalization ("Mom" and "Dad" can also be changed to names). The back is solid red fabric. Looking for a different color theme or style; email us for custom stockings.